This is a guest-post in the form of a written interview with a female hijama patient about her experience of hijama therapy in Toronto, Canada. – What did the treatment involve and how long did it take? 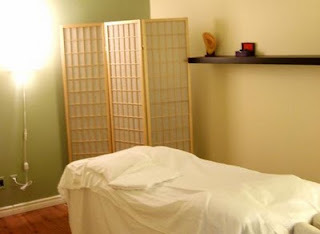 I should mention that when I first called around it seemed like what was common was doing cupping as a form of massage. However, I also asked people if they would do blood-letting in addition to cupping, and the receptionist in this place called the doctor on the line, and she agreed to do it at my request. As this was my first visit, she first did an assessment. Basically she made me fill out a questionnaire and then asked some questions about any medical concerns. I am sure this is pretty routine. Then she assessed my “meridians”. Basically she applied light pressure with her fingers to certain places, and I felt pain! She showed me on my hand how much pressure she was applying (not much), and explained that I had blockages in meridians which were causing this pain. I had lots of questions, which I asked before and during the treatment. She was extremely pleasant and was happy to answer and explain. She showed me the (disposable) needles that she would be using and then she explained each step of the way. During the treatment, in one or two spots I could actually feel the blood draining (not painful, only sensation of draining). I also felt sore in a couple of places. I should mention that she said since this was my first visit and I was not used to it, she would be doing the cupping very lightly and not draining too much blood. She also told me that places with more blockage were drawing more blood. She must have done it very lightly because the next day I did not have the dark red marks that I had seen in pictures of hijamah. Immediately after the treatment and for the rest of the evening, I felt quite tired. The next day I felt really good, and it seemed noticeable. Yes. I like this doctor, she has a really good bedside manner, she was so receptive to my questions and did not mind providing explanations about all I asked. The place is very clean and it is generally for Chinese Medicine, they had other things to offer but I did not pay too much attention as I was uninterested. And she also does acupuncture although she did not do that for me. But she put in a plug for Acupuncture, showing me the needle and telling me the difference. She completed her Chinese medical degree from Beijing University of Traditional Chinese Medicine (TCM). She also teaches Acupuncture and TCM in Toronto. Her info is on her website. – What is the overall prevalence of hijama therapy in Canada? Is it available in hospitals and clinics as a valid alternative / sunnah therapy? I don’t think it is available in mainstream hospitals/ clinics. I understand there are a couple of male practitioners in Toronto, however I have not come across a female practitioner before and have still to hear of a Muslimah practitioner. I have never done hijamah before as I was unable to find a female practitioner. However, I spoke to my teacher (who has taken hijamah treatment from a Muslim) and she explained that the Islaamic way of hijamah involves making small cuts with a blade rather than a needle and that much more blood is let. However, you can see on this site http://kocabas2.tripod.com/id1.html that needles could also be used. If there is any hijamah practitioner who also has some religious education perhaps they could throw some light on whether taking treatment from a non-Muslim (who is not aware of the days/ times nor the sites of placing cups according to the sunnah) whether that treatment would be considered sunnah. As well, if anyone visiting this blog knows of a Muslimah practitioner in Toronto, I hope they will provide the contact info. Our thanks to the sister (who wishes to remain anonymous) from Toronto, Canada for sharing the above post. If you have any further questions to ask about her experience, then please do so via a comment* below. I want to thank very much the owner of this blog as well as the sister who shared her experience of hijama with the Chinese medecine practitionner. How interesting to know that I have an appointment for acupuncture with exactly the same practitionner who did the hijama on Danforth av. I have been reading a lot on hijama and acupuncture and unfortunately hijama with muslim practitionners isn't available in Toronto at least for women. I have my appointment for acupunture but I will ask this Chinese doctor if she could do blood letting cupping for me two. I can also try to have the appointments on those days our prophet SAW advised us to do it. Wish me good luck and I will do my best (if I dont forget!) to report to this blog and share my own experience.